Home Off Beat	Euricase Multimedia Ring Box: Propose in Style! Euricase Multimedia Ring Box: Propose in Style! ‘Money can’t buy me love’, whoever said this, probably ignored all the good things that money can buy, especially when one is out to woo a fair maiden! Look what we have here for someone who is in love and wants to go all out to prove it! It is a ring box, which could make your ring ceremony a memorable day in both you, and your girl’s lives! 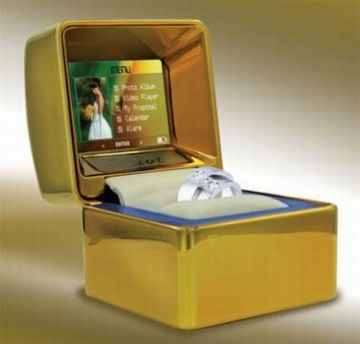 All you have to do is plant the engagement ring in this box, which has a 2-inch LCD built in, that plays video, shows pictures, and a lot more! As your beloved opens the box, LED lights will flash onto the ring and you can watch the twinkle in her eyes. You can set things up via USB on the case and as soon as it opens, the media show starts immediately. What’s more, you can have a slide show of up to 500 pictures or up to an hour of video. Isn’t this amazing! To top it up, the box features a built in alarm and calendar function. You can go for the standard version for $198.95 but by dishing out an extra $50, you can even get a gold or silver plated version. I suggest, you get a solitaire-studded ring to adorn the stunning box, lest your girl stands gazing at the pictures, forgetting the occasion!